Dating back to the 9th century B. C. celery leaves were revered for their medicinal properties. It is interesting to note that only much later, in the 18th century in Europe, was celery used as a food source. One celery rib has only 20 calories, and is an excellent source of fibre, so will make you feel full faster. For those who have love a crunch, but want to reduce calorie intake, celery is a top choice. It is also rich in vitamin A and C, and contains potassium, folic acid, folate, vitamins B6, B2, B1 and calcium. Celery boasts phytochemical compounds known as coumarins, which have been proven to help prevent cancer by enhancing white blood cells activity. Coumarin compounds in celery also protect the vascular system and help relievemigraines. Celery contains 3-n-butylphthaline (3nb), a compound that has been found to lower blood pressure. An animal study at the National University of Singapore concluded that a small amount of this compound lowered blood pressure by 12 to14 per cent and cholesterol by 7 per cent. Humans can get the equivalent dose of this remarkable compound by eating four to six ribs of celery. The compound 3nB has also shown significant potential as a pain reliever in arthritis, fibromyalgia and gout. Studies used a concentrated form derived from the vegetable – celery seed extract. In a 12-week study at the University of Queensland, Australia, 15 subjects suffering from osteoarthritis, osteoporosis and gout were given 34 mg of this twice daily. After three weeks, the average reduction in pain was 68 per cent, with some subjects experiencing 100 per cent relief. Athletes and others losing a lot of water through vigorous exercise need to frequently replace electrolytes. Instead of a sugary drink with artificial flavours, chomp on a celery rib instead. Better yet, juice it as celery can act as an electrolyte due to its high levels of potassium and sodium. Green smoothies are an ideal way to get an ample serving of veggies without labouring over a huge salad. Since celery promotes weight loss, digestive health and also combats inflammation, why not treat yourself to a detoxifying smoothie? 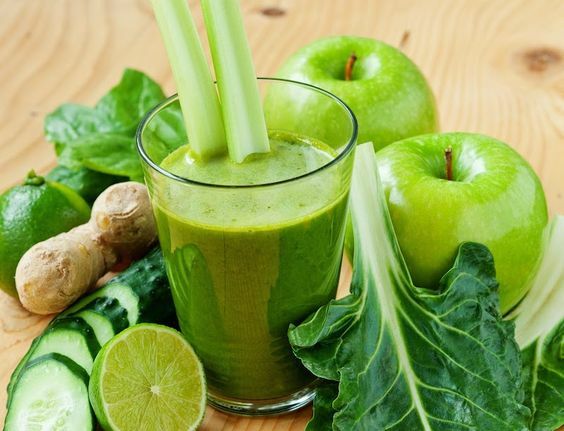 Just blend two fresh stalks, an apple, a medium-sized cucumber, a few kale leaves, a large bunch of spinach, a large bunch of fresh parsley or cilantro and a lemon. Cooked celery has a notably sweeter flavour. Chop celery and cook over medium heat in a skillet with butter or coconut oil until tender. Add half a cup of broth, cover and allow to simmer on low heat for about five minutes. Serve with a dash or two of your preferred seasoning. Since celery isn’t particularly enticing in its raw form, it makes a great addition to salads. Try including it in a fruit salad for a change. Slice an apple and a pear, then toss these in a bowl with thinly sliced celery, chopped parsley and celery leaves. For an luscious dressing, whisk together 2 Tbsps lemon juice, 2 tsp honey, 4 Tbsps olive oil and ¾ cup of parmesan cheese. Add salt and pepper to taste. From a lime and salt base, add minced garlic, chopped onion, a bunch of fresh dill along with a bunch of celery. Store in the refrigerator in a mason jar. Rosemarie Layne is the holder of an Associate Degree in Mass Communication and a certified Early Childhood Educator. A wholistic health advocate, certified in 2nd Degree Reiki, she owns and operates Rose's Wellness Hub. She is also a private language tutor at Personal Touch Language Services and the Principal of La Bella Rosa School of Dance Arts.